WASHINGTON – Immigrant-rights activists and lawmakers Monday accused the Trump administration of erecting a “second wall” to more than 700,000 potential immigrants – including more than 14,000 in Arizona – who have pending citizenship applications. But U.S. 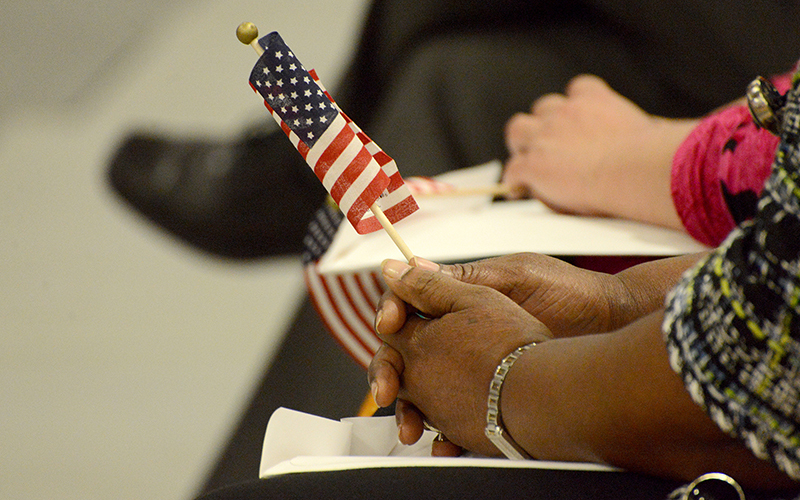 Citizenship and Immigration Services officials said the number of people naturalized is “virtually the same” rate as before, with 700,000 to 750,000 or so new citizens being sworn in each year. And they noted that the biggest increase in pending cases – they refuse to call it a backlog – came during 2016, the last year of the Obama administration. “What we’re looking at is a dishonest and desperate attempt by open-borders advocates to undermine the work of Homeland Security officials, law enforcement and the administration to protect the integrity of our immigration system and uphold the rule of law,” USCIS spokesman Michael Bars said in an emailed statement Monday. The National Partnership for New Americans said it used data from USCIS – the federal agency responsible for processing citizenship applications – to create its “second wall” report. It found that by Dec. 31, 2017, there had been an 87.59 percent increase in pending citizenship applications “above the backlog” that existed two years earlier. The USCIS data shows that the biggest spike in pending cases came in 2016, however, when the number of pending applications went from 388,832 to 636,164. But that increase in pending cases also followed a spike in applications during the last year of President Barack Obama’s term. In 2016, more than 972,000 people applied for citizenship, about 200,000 more than had been received in any of the preceding three years. Since that time, however, the Trump administration has engaged in “a form of extreme vetting that is aimed at slowing down the adjudication of these applications,” said Peter Schey of the Center for Human Rights and Constitutional Law. He joined Hoyt and others who said they plan to file a Freedom of Information Act request for any USCIS internal memos or communications directing officers to slow the process. “USCIS will continue to process all applications and petitions in a judicious and comprehensive manner and will do so as efficiently and expeditiously as possible in accordance with the law,” his statement said. Immigration activists said the delay sends the wrong message to immigrants who are trying to follow the rules, as the administration insists, only to find hundreds of thousands of applicants ahead of them.